Retirement planning at age 50 – Ten key points to remember! Hitting 50 is a milestone when it comes to retirement planning. When you can see retirement in the not too distant future, 50 is certainly a wake-up call more than ever before. Here are our top ten retirement planning at 50 tips which we share with clients who are set to celebrate the big ‘five oh’. 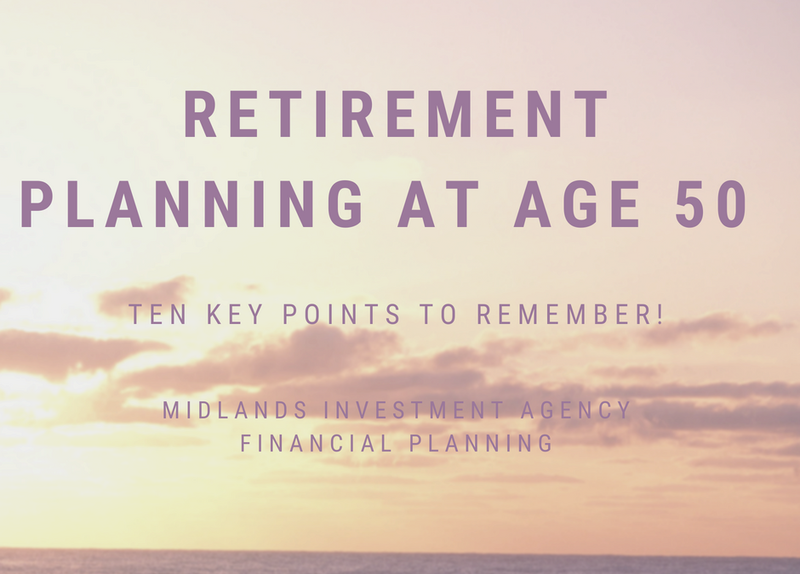 If you are turning 50 start off by pulling together all the information from your pension providers and getting an up to date statement of what they have got. Some people may have plans to retire to the sun, never to move, or simply to downsize. Start thinking about where you intend to live early on, as these decisions can often take a long time to come to fruition. Those aged 50 now will not receive their state pension until age 67. Many of us will not have saved enough in our pensions, meaning we will need to work until we are older compared to those retiring now. Around a million people over-60 work part-time in the UK, working shorter hours and phasing into retirement. Employers are no longer able to force employees to retire just because they reach a certain age. The state pension provides an annual income of £8,546 in 2018/19, but for most of us this simply will not be anywhere near enough. Work out how much money you are spending now, and I mean absolutely everything. Include going on holiday as well as the household bills and mortgage repayments. Your next job is to work out what you will spend when you have stopped working altogether. Think about what you will realistically need to live on, including all the nice things to enjoy in retirement. The chances are that once you have done your calculations, you will find that you have a gap in your saving. Don’t be put off doing something about it as you still have time to change your retirement income. Even paying a small amount more into a pension can make a big difference to your income in retirement. If you share your finances with your wife, husband or partner, consider their pension situation as well. It is also important to make sure that your pension schemes know who you should receive the benefits in the event of your death. Most personal pensions will allow the full value of your pensions to be paid to your nominated beneficiaries without tax if you die before age 75. After the age of 75 is somewhat more complicated and could result in a tax charge for the beneficiaries. Taking retirement planning seriously should start at age 50 if you haven’t already. Checking your pension regularly is a good habit to get into from age 50. Most pensions can be viewed online, and you may also want to consolidate your pensions making them easier to keep track of. Make sure you are not giving up any valuable guarantees particularly on some older pension plans. Since April 2015 the rules about what you withdraw income from your pension has become much more flexible. You can still choose an annuity, which will provide a guaranteed income for the rest of your life, compared with the ability to draw an income directly from your pension. Using the pension pot to buy a secure income will be the right choice for some people, particularly if they would be nervous about their investment and had little or no other secure income. For those people who do not need a secure income, the flexibility of keeping their money invested may be attractive. You can always do a bit of both, buying an annuity to cover the retirement essentials whilst using income drawdown for other spending. At this point, it is critical that your pension investments are invested in the right funds for you. Protecting what you have already built up and controlling how much risk you are exposed to is very important at this stage. You may only have 15 to 20 years before you start using your pension, so plenty of time to invest and benefit from the stock market op’s and down’s. For example, if you have accumulated £100,000 in your pension by the age of 50, your pension fund could double or treble over the next 15 to 20 years through additional investment and growth. The first thing to do is get started and seeking professional advice may be just what you need. With retirement now appearing on the horizon, it is important not to forget your other financial objectives. This could be paying off the mortgage, helping your children with university fees or other near term financial goals. Are you concerned about your how your plans for retirement? Not sure if you are on the right track?